Tired of the same old leafy green salads? 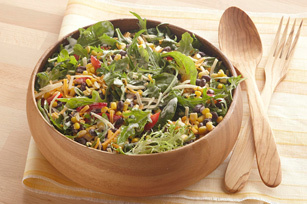 By simply adding beans and corn, you turn an everyday salad into a lip-smacking Southwestern-inspired salad. Mix dressing and pepper sauce until blended. Combine all remaining ingredients except cheese in large bowl. A quick way to enjoy your favourite salad on the go is to wrap it in a whole wheat flour tortilla. Simply spoon salad onto tortilla, then roll up. Wrap in plastic wrap and refrigerate until ready to serve. This is also a great way to use leftover salad. Enjoy this delicious salad any night of the week. As a bonus, the salad greens provide an excellent source of vitamin A, per serving.